Oh Well, there is so much to write about this peach of a product. 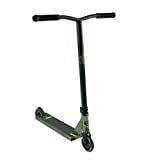 Yes, we are talking about the one and only Tanner Fox Signature Pro Scooter by Lucky. Throughout this piece, we will be examining the Limited Edition scooter in great detail but let’s start with some major highlights of the official Tanner Fox Scooter. This TFOX Scooter is not just another scooter you will find in stores. It is a complete package. There is hardly any flaw in its construction, design and what it is capable of. Everything is designed keeping in view the requirements of modern riders and everything is a result of years of experience and collaboration. The Tanner Fox Signature deck is a perfect 19.5 x 4.25 in, the amazing 82.5 headtube angle (which adds great safety to the ride) and a fully integrated headset – making TFOX SIG PRO your dream ride. The package also includes a tool-less compression system, triple clamps, Vice Grips and Steely Brake. Ahh, and not to forget those elegant black wheels. This Lucky scooter makes for a brilliant gift for any scooter kid this Christmas! Bars in any pro scooter are one of the most vital parts. The bars in this amazing Lucky TFOX signature scooter are called kink bars, which are nothing short of exceptional (and that too in every regard). Talking about its measurement, the bars measures 584 x 584 mm. The material used in its making is high-class, and ultra strong Chromoly 4130. The fork on Tanner Fox Scooter is nothing short of exceptional either. It is called the Huracan HIC Fork, which is made from world’s strongest, aircraft grade aluminum. The fork on Signature complete Tanner Fox Scooter are exceptionally strong and durable – thanks to the robotic TIG welding. The wheels on this lucky scooter are amazing. Built from the 6061 aircraft aluminum, it is really hard to find a terrain that can give tough times to these wheels. What makes the wheels on this Tanner Fox Scooter a treat is the design. The company decided to add some cool graphics to the wheel along with the signature of Tanner. So, this TFOX scooter is not only about pleasure in the ride but is designed to impress as well. Yes, we are talking about the custom graphics that you get with this amazing Tanner Fox Pro scooter. The designs, colors, and graphics are the result of hard work from the Tanner itself. Beautiful, bright colors, custom graphics, and the same old neat black grips and Lucky Tanner Fox Signature wheels are bound to make head turns around you. You don’t need anything else when you are at the skate park while practicing your skills, and Tanner Fox Sig PRO is the ride you have. The TFOX Sig PRO was completely designed by the champion himself. With sweet art, a cool green color and Tanner’s signature – this product is really hard to beat. Since years scooter sport is counted amongst the most dangerous yet thrilling activity. From kids to adult scooters, every trainee work-hard to look professional in the playground. Here TFOX Signature Pro scooter comes into play for making your efforts worthwhile. Lucky is one of the most popular companies in the pro scooter scene. That is not it!, Lucky support retailers, riders and many events for advancing this sport to a whole new level. Whether you are a speed chaser or a tricky savvy TFOX Signature Pro Scooter by Lucky will pass you in every genre with distinction. When you are riding TFOX no other scooter can match up your potential. The full form of TFOX is Tanner Fox. This 17-year old wonder kid started his youtube channel in September of 2011 under the name of MTFilms. So what is the big deal in it, right! and how come lucky pro scooters collaborated with this guy? Tanner was into scooting since he was young. Like every other eleven-year-old kid he recorded his skill demonstrations and start uploading them to Youtube. Who would have known that after some time this little boy would be leading the scooting industry? Now Tanner Fox holds an audience of 5.7 million people on youtube telling him to back not, back not. Lucky Pro scooters collaborated with Tanner Fox to craft Tanner Fox Pro scooter so other riders looking up to him can get a right partner to rock up the park. Lucky and Tanner Fox needs no introduction in the scooter world. This time around, they have created a masterpiece by working together on a scooter called TFOX Sig Pro Scooter. In this classic, the Tanner Fox legendary Tanner Fox Signature deck is combined with the ever so durable parts from Lucky. These parts include the state of the art kinkbar, hollow core Lucky Tanner Fox Signature wheels of 110mm and an amazing Huracan HIC Fork. We will be taking a look at these parts in more details later in our review. For now, let us discover this product in more detail. Tanner Fox SIG PRO Scooter is almost unbreakable. When you buy this great product, you are actually investing in a product that is made to last. There is nothing more damaging and heartbreaking than breaking your scooter early in its days. You don’t want your friends to make fun of your ride, do you? Engineers and designers at Tanner Fox understand this and have put n everything to make your ride last for years without any major wear and tear. This super durable ride is crafter out from the aircraft grade strong aluminum. The material used in its making ensures that all the needs of freestyle riders are met. When you are on TFOX SIG PRO, you don’t have to worry about breaking a Lucky Tanner Fox Signature wheel or a bar and keep your focus only on learning new tricks and impressing the crowd. The robotic welds used in the making of this ride makes the overall package extra durable and guarantees out of this world strength. And to put the cherry on the cake, the Lucky Tanner Fox complete package is backed up by a cool 180 days warranty. When we talk about any scooter, probably the most important factor in deciding whether to buy it or not is the weight it carries. 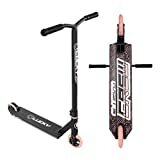 These scooters are not intended to simply travel from one point to another but to bear all the hardships of riders performing different tricks and stunts on them. They have to bear the rider’s weight plus impacts of different intensities throughout their life. This is the reason why they have to as lightweight as possible. Being lightweight also enables riders to handle the ride seamlessly – and focus more on their game rather than handling the ride itself. Say hello to the TFOX SIG PRO Freestyle Scooter – the lightest in weight in the Lucky lineup. This cool Lucky TFOX signature scooter weighs only 7.9 pounds making it one of the fastest. The lightweight of TFOX SIG PRO actually ensures successful implementations of some of the heaviest tricks and stunts on the circuit. The technology used in the making of these wheels is the famous Lucky Rebound Technology. The innovative use of technology doesn’t stop here – the wheels are fitted with Speedrool bearings, which makes the ride extremely smooth even at higher speeds and uneven terrains. Talking more about this technology, it is a mix of high-performance urethane, curing method, and a pouring process which makes the roll on these Lucky Tanner Fox Signature wheels extremely fast, grippy and buttery. The journey of Lucky was never easy. When they started making scooters and scooter parts, it did not come easy. However, Lucky always had one thing with them, right from the day one – and that was unmatched commitment. The company learned through trial and error and years of experience that is what it is like to build unbreakable parts and world-class scooters. It is because of the continuous hard work, commitment, and use of technology that best manufacturers, engineers, designers and urban illustrators favor to work with Lucky. To find out the best scooters for this Christmas, click here. When you’re talking about products from Lucky, like this Tanner Fox Scooter – you can be absolutely sure of amazing ride quality, functionally superior product, and out of this world use of art and colors. Other than that, Lucky has always been one step ahead of the competition when it comes to working and giving a boost to the sports itself. It is Lucky’s never-ending commitment to advancing the sport and its pursuit of excellence that majority of the professional riders favor the products from the company. So, summing it all up – if you’re a fan of Tanner and you’re looking to buy a scooter then Tanner Fox Scooter from Lucky is an exciting bet. It doesn’t only offer a professional ride, but things like unique design, Tanner’s own signature, and amazing durability makes this Lucky scooter one of a kind. Whether you’re a professional going for an even, have average skills or just a beginner looking to acquire new tricks…Tanner Fox Pro from Lucky is your scooter! Next articleHow do you Lace Skate Shoes? Tanner Fox and Lucky did a good job on this scooter – I do really like it. The kid just irritates me lol.